Pierre Sleiman is the founder and CEO of Go Green Agriculture, an innovative company that grows produce inside high-tech greenhouses using hydroponics. 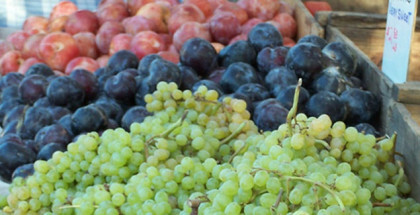 Go Green’s mission is to setup greenhouses across the country to provide local jobs and fresh, delicious, and nutritious produce to the community. Pierre has become involved in the mission of accelerating the movement towards local and sustainable farming and fostering interest in youth to choose agriculture as an exciting career. Doctor Gene A. Giacomelli is the Director of the Controlled Environment Agriculture Center [CEAC] at the University of Arizona in Tucson, Arizona. Dr. Giacomelli has designed, constructed, instrumented and operated various types of environmentally controlled greenhouses utilizing hydroponic-based crop production systems, including NFT, Ebb and Flood and aeroponic systems for greenhouse lettuce, tomato, strawberry, and numerous other crops. He recently completed Sabbatical leave in Italy with aerospace companies, Aero-Sekur and Thales Alenia Spazio, and with several universities, with focus on Bioregenerative life support food systems for Moon, Mars and Earth. Click here to register to learn more about opportunities in indoor farming in Riverside and beyond! David Rosenstein built the first aquaponic farm in Los Angeles County and developed an urban agriculture educational platform called THE ART & SCIENCE OF AQUAPONICS for public schools, universities, and the general public, through a company he founded- Evo Farm LLC. He consults on design, feasibility assessment and installations from residential to industrial scale aquaponic farms. He developed Nano Farms™ a product line of recreational/ educational scaled aquaponic systems that grow the most amount of food in the least amount of space. David is the Treasurer of the Aquaponics Association. He also has served on the Aquaponics Subcommittee for California Fish and Wildlife, and the Urban Ag committee for the Los Angels Food Policy Council. Jim Bergantz works as a Sales Engineer for Agra Tech, Inc. a manufacturer of quality greenhouses and accessories as well as a distributor of the best available equipment for commercial horticultural and agricultural growers, retail nurseries, research and education facilities. Jim literally grew up in a greenhouse and purchased his parents’ retail nursery and wholesale/retail growing operation right after graduating from college. There Jim found his passion in growing bedding plants, native trees, shrubs and poinsettias and learned there is no substitute for getting one’s hands dirty and working hard. 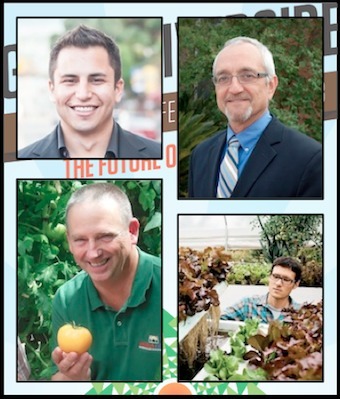 If you want to get the lowdown on the nuts, bolts, challenges and opportunities of launching an economically viable indoor farming operation, you won’t want to miss this session. 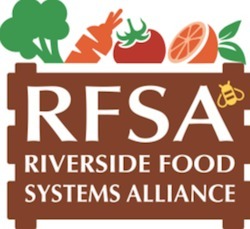 Healthy Riverside Initiative Emphasizes Local Food, Looks to Make County # 1 Place to Live in U.S.